As connected educators Brent and I strongly believe in ALL educators being connected. We believe that building and developing a PLN (Personal/Professional Learning Network) is an important task for ALL educators to be doing, not just a few. We also believe that ALL educators bring great value to the table as someone who can SHARE the great things happening in their classrooms, schools, and districts via Social Media like Twitter! As educators we sometimes become idea hoarders and are afraid to share some of the successes in our classrooms because we feel like we are bragging. I am convinced that there is a plethora of great educators out there who have started a Twitter account, used it consistently, but haven’t gained a large number followers, for some reason or other. 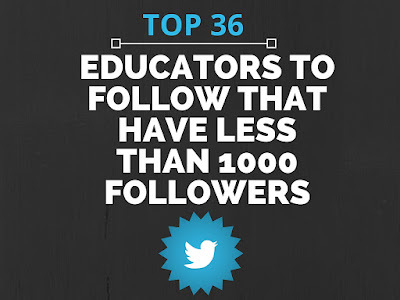 Perhaps our list of 36 educators are typically not listed in articles talking about the "Top 25 Educators to Follow" on Twitter by popular educational companies like Edutopia or Education Week, or another person on Twitter with a massive amount of followers, but it doesn’t mean they are any less of a potential contributor to one’s PLN. They are simply great teachers. To Brent and me, the number of followers we have on Twitter doesn’t matter! Yes, it’s easy to get caught up in that when you first get started on Twitter. Heck, I even wrote this blog post back in 2012 about my Twitter numbers. What was I thinking?! 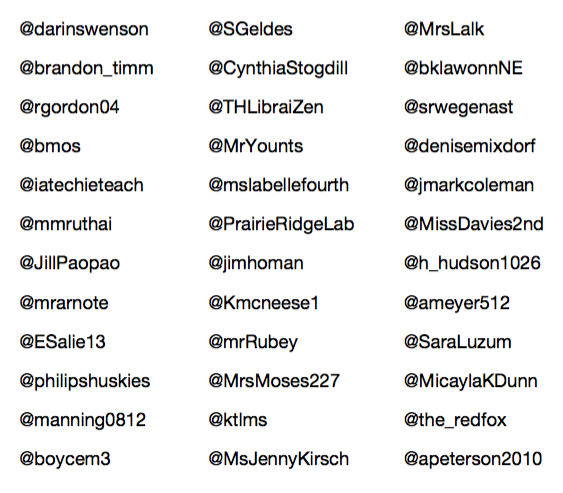 In one of our many discussions about Twitter we discussed how awesome it is to FOLLOW educators back that follow us! Not ever limiting ourselves to certain numbers or acting as if we are too good for them because they may only have 24 followers. Every member of your PLN is important. Follow them. Never limit your numbers. We also discussed the fact that we try to respond to ANYONE who tweets us with a question or thought. I know I was frustrated several times when I started on Twitter because someone wouldn't respond to a tweet I had directed at them. We feel like anyone who wants to join our PLN is more than welcome! You follow either of us, and you are an educator, we are probably going to follow you back! Just make sure you have a great bio explaining who you are and what you do in education! And be sure to add a profile picture of yourself! 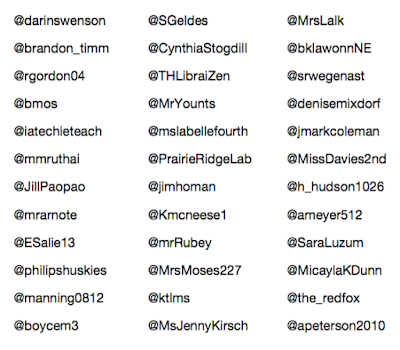 This amazing group of 36 educators that have less than 1000 followers are a group that anyone could easily learn from, collaborate with, and break down classroom walls! So, GO FOLLOW THEM because they are fabulous educators! Great list! Thanks so much for compiling this!